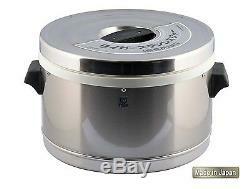 Tiger 32 Cup JFM-570P Food Rice Thermal Warmer. Commercial Thermal Food Holder - Non Electric MADE IN JAPAN. Non-Electric Capacity [liter/cups] 5.7L / 32 cup Temperature retention (6h) [°F / C]: 172.4F / 78C(6h) Size (width x depth x height) [cm]: 43.0 x 36.0 x 31.0cm Weight [kg]: 4.8kg. The item "Tiger 32 Cup JFM-570P Food Rice Non Electric Thermal Warmer Made In Japan NEW" is in sale since Thursday, November 17, 2016. This item is in the category "Home & Garden\Kitchen, Dining & Bar\Small Kitchen Appliances\Slow Cookers & Pressure Cookers". The seller is "tri228" and is located in New York.